What do we tell our kids about Orlando? How do we begin explain the hate and violence that took 49 beautiful people from this world? How do we explain that dehumanizing words have a way of turning into dehumanizing violence—that when we fight with our words, at some point words become fists… or in this case, bullets? To be honest, I don’t know everything we should say. But here is what my children know: when the vigil candles come out, that’s when we show up to love. So the other night, we lit candles. We listened as the LGBTQI community grieved. We stood shoulder to shoulder against hate. I decided early on as a parent that I wasn’t going to water down the bad things that happen—because I was scared that if I did, I might inadvertently water down the power that good has to overcome evil. The power that love has to look pain in the eye. I don’t want my kids to hold an anemic love in their hands, to feel lost or victimized in a big, scary world. I want them to experience the power that resides in their little bodies, that expresses itself in quiet, small words to defy hate and violence. I decided early on that I wasn’t going to shield my children from the violence of this world—because I don’t want to shield them from an even bigger reality: light always breaks darkness. Love defies hatred when we stand alongside our neighbors and say no more to violence. My children need to see that their presence is powerful. That love shows up, not merely in the form of Facebook likes, but in person. I hope they’ve experienced this truth as they’ve touched shoulders and carried candles and sang “This Little Light of Mine,” as they’ve marched down Main Street to remember Michael Brown’s life, as they’ve stood alongside Muslim college students mourning the murder of three young Muslims in Indiana. Losses as big as these need a community to bear their weight—and my kids are part of that community. They are not scared and they are not scarred. 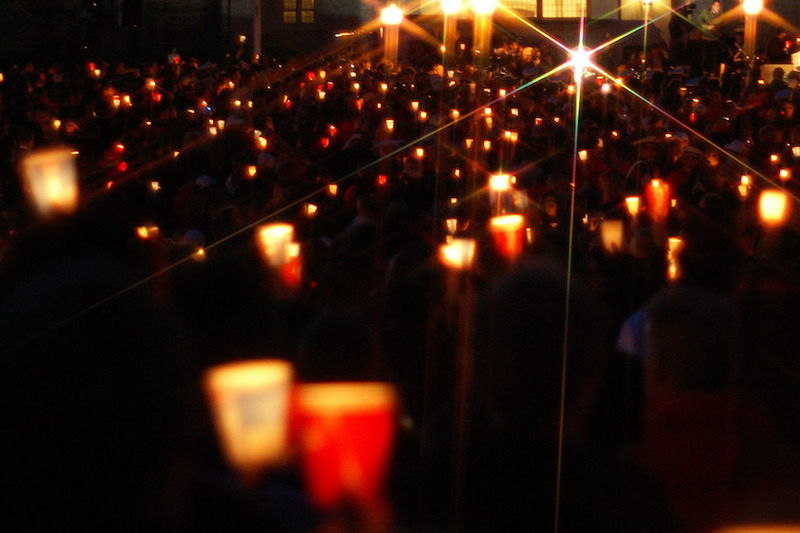 They know it’s important to show up in person and hold a candle, listen to a community that is hurting, and remember the names of those who were taken by violence. They know there are two kinds of people when something bad happens: those who need our solidarity and those who rush in to be that solidarity. My children know which ones they are. They might not know what tragedy will happen next. But they know who they are. They know how they will respond. It’s that simple to them.